BRYAN EATON/Staff photo. 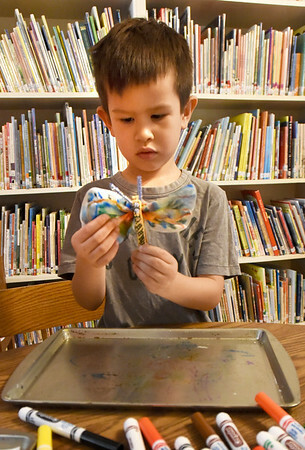 Cameron Snell, 5, creates a tye-dye butterfly at the Emma Andrews Library in Newburyport on Friday after having books about butterflies read to them. Youngsters from Our Secret Garden preschool at the First Newbury Parish took a field trip to the branch library.